Citibanamex blamed a glitch in the system for the decision, which left María Félix Nava unable to collect her welfare payments. After the story was picked up by local media in Guadalajara, an official stepped in to deliver a cheque by hand. New transparency laws require benefits to be paid into individual accounts. Mrs Félix said she went for three months without the state payments after she was turned away from her local bank branch. "They told me the limit was 110 years," she said. Citibanamex, a unit of Citigroup Inc, blamed the "calibration limits" of its system, which would not register a number as high as Mrs Félix's age. Miguel Castro Reynoso, development secretary for the state of Jalisco, visited her house to apologise for the situation, which he called atypical but absurd. He said he was grateful for the media for bringing the case to his attention and said he would work to ensure it did not happen again. "Sooner or later, God provides," said Mrs Félix after receiving the missing payments. The bank is working to get her a bank card as soon as possible, Reuters reported. Ms Felix turns 117 in July, according to her birth certificate, which local authorities recognise as authentic. She says she was orphaned at the age of seven and has outlived six of her 10 children. 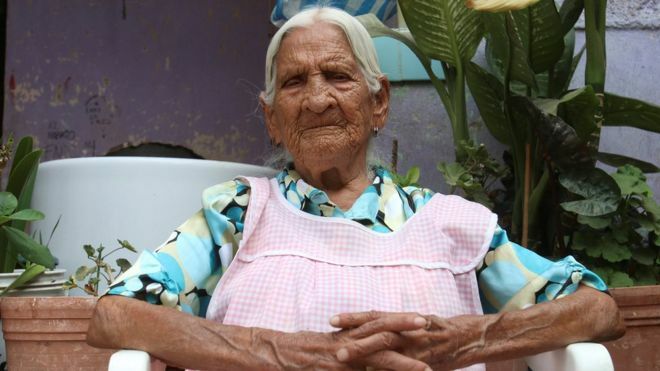 A Mexican bank has said it will let a 116-year-old woman open a bank account, after originally rejecting her for being too old, BBC reports.